(L to R) Glyn Barrett from Mulbury Homes enjoys a cup of coffee with TFC’s staff member Maggie Singleton, a service user Edna Aspinall and Mulbury’s Kevin Morris. The coffers of an award-winning Preston charity have been boosted after housing developer Mulbury Homes gave it a helping hand. 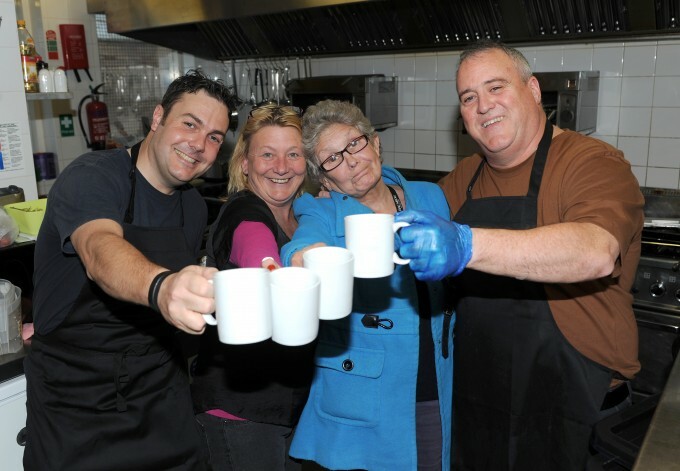 The Foxton Centre, which supports some of the city’s most vulnerable groups, has received a £500.00 donation from the company to help fund a variety of its community projects, while three of the company’s senior management team volunteered their time to serve hot food and wash dishes in the centre’s community cafe. Mandy Stitt, interim chief executive of the Foxton Centre, added: “The staff, volunteers and people who come to The Foxton Centre, really enjoyed and appreciated the Mulbury team helping out in the kitchen. Mulbury’s scheme at New Hall Lane is being constructed in three phases and will provide a mix of affordable housing and a 70-home extra-care facility aimed at older people in Preston.